As the Harvest Festival nears, Callie wanders off and gets lost in the woods. She’s scared of the dark, but she was never afraid of the pumpkins. Josh’s clever idea about how to find his sister means he will have to give up his magic pumpkin and any chance of being crowned king. The whole town is united in this heartwarming fall story. A welcome relief to the spooky, sugar-charged mayhem of many Halloween tales. Kathryn Lay is a full-time writer and instructor. She has taught writing classes at www.coffeehouseforwriters.com and regularly speaks to libraries, schools, bookstores, and at writers’ conferences. Her book Crown Me! has been awarded the 2004 Best Juvenile Book from the Oklahoma Writers’ Federation, Inc. and the 2005 Golden Spur Award. Lay has published more than fourteen hundred articles, essays, and stories for children’s and adult magazines and anthologies, including Highlights for Children, Woman’s Day, Jack & Jill, U.S. Kids, Pockets, Cricket, Spider, The Writer, Writer’s Digest, Boys’ Life, Children’s Book Insider, Spellbound, Wee Ones, Hopscotch, Teen Power, Teen Life, Children’s Playmate, and the SCBWI Bulletin, among others. Lay resides in Arlington, Texas. Katy Bratun’s art has appeared in picture books, advertisements, greeting cards, puzzles, posters, museum banners, stickers, kids’ craft projects, and game boards. She enjoys talking about the creation of picture books to children in school and library settings. She is a member of the Society of Children’s Book Writers and Illustrators and belongs to the Picture Book Artists Association. She resides in Salem, Massachusetts. Click here for Chapter 1. Click here for the Front Matter. 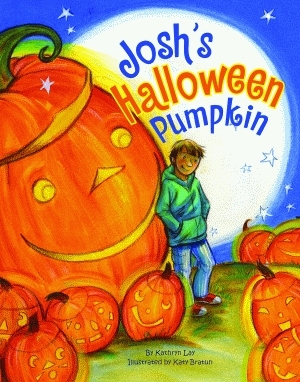 Click here for the Josh's Halloween Pumpkin teachers' guide.